It's a rare thing to see a Grenache from the Russian River Valley and what's even more rare is that it would taste this darn good! As we all know Pinot Noir takes central stage in this small part of Sonoma County and you'd probably think someone was nuts to plant a Rhone varietal there. This is a small 69 case production so you'd be lucky to have a bottle because it's sold out of the winery. 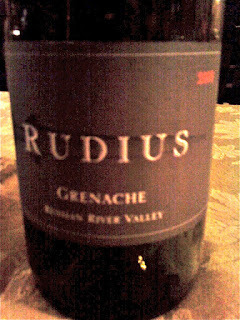 It's 100% Grenache whole cluster pressed and aged in neutral oak. On the nose I get scintillating aromas of strawberry rhubarb, wild strawberry, crushed stones, chocolate, and an aroma that I have rarely used......Goji Berries! There is a slight earthiness to this wine as well but the fruit shines through so clearly that any secondary soil notes are only minutely apparent. Oh, this sounds wonderful. I enjoy the Pinot Noir's of the Martin Ray wineries and those are very popular in the region. I'll have to give this one a try. Thanks.